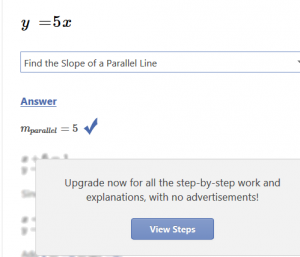 Mathway is free to sign up and it will show you the answer to pretty much any math question! However, as the picture below shows, if you want to see the work for the solutions you have to pay a monthly subscription fee. To use Mathway, just type in some math and then the dropdown will provide several options that the app can do for you–all of these options are 100% free ; however, if you want to see how the app got to the solution, then , sorry you have to pay a monthly fee. Read this article for a more detailed review of the Mathway app. Or you can just try Mathway for yourself and see what you get for free.